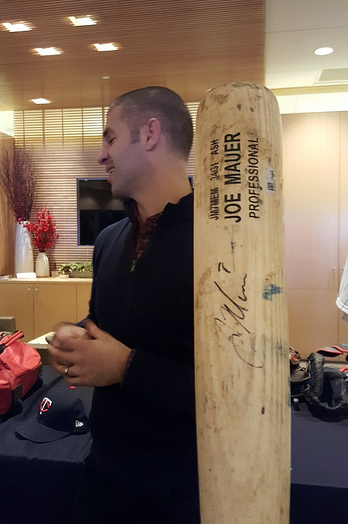 Despite my one-more-year campaign, Joe Mauer decided to retire after the 2018 season. 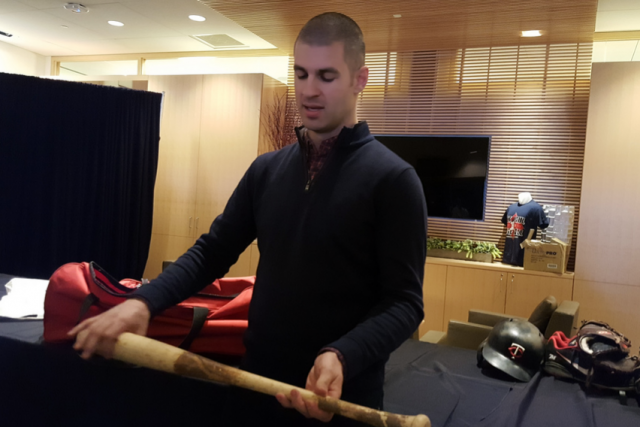 After the surprise appearance as a catcher in the final 2018 season game, he packed up all his gear after it had been authenticated and handed the bag to the Twins curator, Clyde Doepner, so it could be shared with fans. Clyde hadn't decided quite what to do with the bag until he found out there would be a special white-glove tour with Joe auctioned off for TwinsFest. 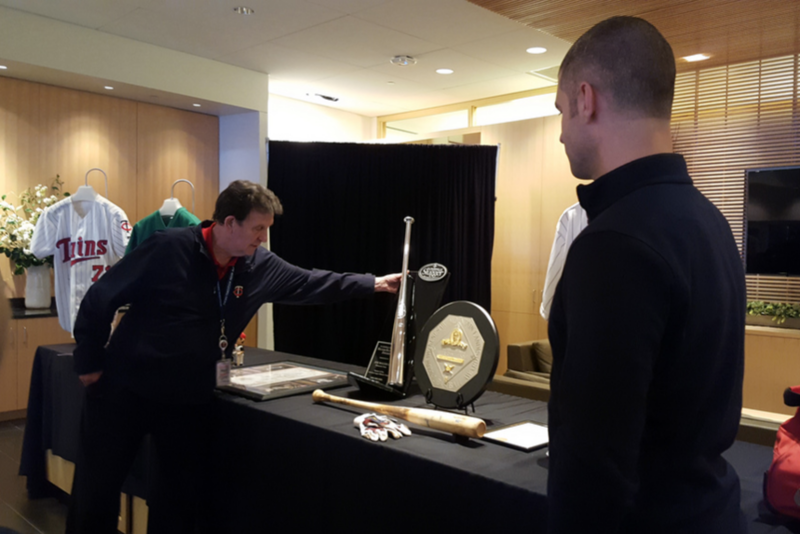 Clyde decided to have Joe unpack the bag and take the group through what each item was and talk about his career. We didn't know this when we bid on the tour and I suspect had folks known, it would have gone higher. This flickr album has all the photos with detailed descriptions. I wasn't supposed to video anything but recorded a few before I was scolded. The lady next to me took a bunch more so if you know her, you can hear more. I recommend looking at the album on a laptop or a tablet since the descriptions are more easily viewed on a full -size browser. They explain many of the markings in or on his equipment and give the details he shared about each piece. The bat and batting gloves are from his 2000th hit. I was at Target Field that night so it was special to get to hold them. He talked through how he chose his bats and explained how he listened to the sound a bat makes when tapped on the barrel. The higher the pitch the better. The 2000th hit bat had a pretty high pitch. After holding the bat and lowering it to tap his shoes, as we've seen him do thousands of times, he explained the pre-at-bat ritual of raking the dirt with his cleats then tapping his shoes. It was so he was able to see precisely where his feet went during a plate appearance. It gave him an immediate visual clue if something was off. He also raked the dirt in front of home plate as a catcher to prevent a bad hop on a ball in the dirt. Same for the semi-circles while waiting on batters at first base. His process was all about doing every little thing he could to prevent as many 1-in-a-1000 events that might negatively impact his ability to make the play or get a hit. Joe has given some less than engaging post-game interviews over the years, but he talked with ease Friday night and seems to be genuinely at peace with deciding to retire. I'm still in denial he won't take the field on Opening Day, but really enjoyed the hour hearing him talk about baseball. I'm so going to miss watching him play. Wish they would've waited a year or two before they started the Mauer marketing. We haven't even had a chance to miss his greatness. Really cool stuff. Thanks for sharing. And most important... did you get resolution to your autograph situation? I still can't believe that last game. I fully expected everybody to just play it off like just another game, especially since he hadn't made an announcement, but Joe appears to have opened himself up more to embrace some of the attention he seemed to shy away from in the past. It sounds like he loosened up for this tour as well. I also noticed in his chat with WCCO that interviewers are starting to ask him some different questions, and he talked some more about his days as a catcher. I hope he enjoys the next several years with his young family, but I think he could be an outstanding broadcaster or instructor of some kind when the time comes. I thoughtthe same thing about the WCCO interview.I have noticed a couple of times in the past when he had been interviewed by some national sportswriter that he gave more interesting answers largely because they did ask him some different questions. He did not just shoot of a canned response which he could often do with the local interviews because they often asked him the same thing over and over. I remember someone (I think it might have even been Souhan) saying that when Joe does not have to answer questions about himself and how he is feeling he actually has some interesting things to say about the game.He might end up being a much better interview as a relaxed retiree than an active player who probably often felt he had to be politely defensive and guarded in his responses. What I will miss is the simultaneous move to unbuckle the shin guard on a 3-2 pitch as the umpire says "ball 4" and Joe began his trot to first base all in one continuous motion. Pure poetry. He was able to have the guard half way unbuckled as the pitch thumped into the catcher's mitt and, on the rare occasion that the pitch was called a strike, the glare was priceless. I put in a bid on this, seeing that this was a potential once-in-a-lifetime type of event.I just couldn't stay in at the final bid price.I might regret it later. Some guys did a bat flip when they knew they crushed one.Not Joe.When he "crushed it" he unhooked the shin guard. Eric Gregg says, "pfffft, amateurs."